Fashion is in a constant state of evolution. The technological advancements are only accelerating this concept. Tech and fashion are merging together to create smart textiles without sacrificing style, comfort and practicality. Gone are the days where a shirt just functioned as a piece of fabric that provided minimal protection from the elements. Today, clothing can be as smart and as multi-functional as the smartphone in your pocket. Nanotechnology was already a huge leap forward for the textile industry, with Online Clothing Study noting that fabric with the nanotech treatment turns it resistant to water, stains, and wrinkles. You’ll often see it marketed as athletic wear with claims that it has odour control, moisture wicking and UV protection, among other qualities. The nanotech innovations in fitness gear may have paved the way for the innovations we now see in the fashion industry, just as the health and wellness market was where wearable technology really took off. It hasn’t slowed down since, and it is listed as the top fitness trend for 2019 by the American College of Sports Medicine. So, you should definitely expect more people wearing smart clothing in the gym at the start of this year. The materials that make up smart fabrics can range from high-grade polymers for maximum comfort to threads equipped with tiny sensors that respond to stimuli and perform a specific function. For instance, the NADI X yoga pants vibrate to guide the wearer through correct yoga poses, making it the modern yogi’s best friend. Another notable product is Lumo’s pair of smart running shorts that can be connected to a smartphone. It provides running-specific metrics such as cadence, pelvic rotation, and stride length— insights that can significantly improve your technique. There are also innovations that aid in rehabilitation from strenuous activities. A feature post by Coral notes how Italy’s national team wore kits with built-in micro-massagers, during the 2014 World Cup, that facilitated faster muscle recovery. These products, along with posture-correcting shirts and tracker-enabled sports bras, are geared toward enhancing fitness routines, preventing injury, and helping with physical rehabilitation. However, fitness junkies are not the only ones who benefit from garment technology. Pretty soon, colour-changing fabrics will be ubiquitous among the fashion-conscious crowd. The University of Manchester’s National Graphene Institute collaborated with Cute Circuit and came up with a dress that does exactly that; it changes colours in response to the wearer’s breathing patterns. LOOMIA produced a similar dress but the change was triggered by fluctuations in the room’s temperature. 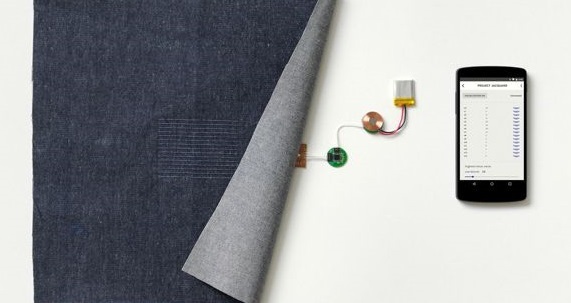 In e-textiles, Google partnered with Levi’s to announce Project Jacquard, a denim jacket that can provide directions, change the songs on your smartphone, and even make dinner reservations. Another exciting innovation is the energy-harvesting fabric developed by the Georgia Institute of technology; the fibres are created with solar cells that can collect and store energy from the wearer’s movement. It then generates electricity, which can essentially turn your trousers into a portable outlet. While fashion design has definitely evolved with technology, manufacturing isn’t far behind. Data analytics, Virtual Reality, Artificial Intelligence and other technological tools are helping create a more personalised experience for the user. Soon, you will be able to design, fit, and purchase garments through your computer screen. Tailors will be automatic too. Design World Online explains that advancement in robotics is already infiltrating garment production. Sewbots by Softwear Automation specialise in sewing with precision and speed, a huge step forward from earlier robots that couldn’t handle intricate tasks such as this. There’s still so much potential when it comes to the fusion of fashion and technology. Data will continue to inform designers on what consumers want to see on the market while automation will infiltrate the production process. Retailers, in turn, will slowly transition to online spaces and consumers can expect more intelligent and personalised clothing to shape the future of fashion. About the author: Kyle P. Carson is a fashion journalist who's covering the industry for more than 25 years. Having branched into fashion photography, Kyle loves to share his knowledge of the industry by occasionally writing blog pieces. Few examples of future trends in garment technology and manufacturing.